My mother used to take me to the library. I remember it being a very long walk, across the iron bridges that crossed the railway, down an endless leafy street, through a park and past the milk depot. A really, really long walk for a child but one that planted a desire for books within me (like a thirsty man crawling across a desert towards an oasis, I knew that there was something worthwhile at the end of my trek). I was always deposited in the children’s library as my mother disappeared into the main section. Left to my own devices, I would usually drift towards the work of Spike Milligan and Dr Seuss. I went for humour in those days and these were my favourites. My mother would, on returning to collect me, urge me to borrow the Just William books that she’s enjoyed in her childhood. I sometimes did, and enjoyed them too. My only other earliest memories are factual books, the inevitable dinosaurs and astronomy. I remember being particularly fond of one giant textbook entitled What Makes it Go. Taught exemplary library manners, I would present my borrowing selection to the librarian (four at any one time I recall) all neatly opened at the correct page and ready for stamping. Other library etiquette, such as keeping quiet at all times, appears to have come to me instinctively. This seemed to put me in good stead as, ten years or so later, I applied for and was accepted as a Saturday assistant in the same library. I didn’t work in the children’s library, and was instead left to deal with the pensioners and their hardback mysteries, and the Dads of schoolmates who would sometimes recognise me. It was a pretty laid back job, although I always fell down on one thing. People returning their books late were subject to fines but I always felt awkward making them pay. People penalised to savouring their books just a little bit too long? It didn’t seem fair. These days I’m a slave to Amazon. I visit a library only rarely and I sometimes feel a pang of guilt; I should browse and I should borrow. Although I suspect I would over-borrow, take too long to read and end up being fined. I did introduce my daughter to the library in her early years and admit being put off by the shelves of DVDs that have the habit of enticing children away from books. And because of this we now tend to treat our local Waterstones as library-ish. You can’t borrow, but you sure can spend a long time hiding in a corner and reading. Inspired by Simon’s post I’ve been giving some thought to my holiday reading this year. As I’m currently restraining myself from buying anything new I’m going to find it difficult to pass the airport exclusive stands. Like a smuggler who tries to pass through customs as quickly as possible on the way in to Heathrow, I’ll be dashing past Waterstone’s with my head down on the way out. But I’m determined to keep plundering my existing stock of books. I’m currently halfway through Cormac McCarthy’s The Crossing. It’s taking me so long to read that I’ll probably be taking it away with me in a couple of weeks time. And if I can stomach any more McCarthy I might also pack Cities of the Plain, the final part of his Border trilogy. Although experience has taught me that it’s wise to leave long periods of rest between McCarthy novels. This weekend it’s the annual harbour festival in Bristol. Finding the heat and crowds overwhelming yesterday, I excused myself for an hour to find a quiet and shady tree to read by. I noticed only one other reader in my field of vision, a young lady halfway through The God of Small Things. So a chance inspiration for my next title. The other books will possibly be a choice between The Bone People by Keri Hulme, something else by Joseph Conrad or Graham Greene (often good for holidays). Or I may allow my wife to buy an airport exclusive for me. Which isn’t really cheating. A benefit of writing online book reviews is that you don’t have to finish reading a book before you start writing about it. I usually do, because it tends to make sense, but quite often I list books I’m intending to read before going off to read an entirely different list. And quite often I abandon books I’m not enjoying halfway so I can sit at my keyboard and rant about them. This time it’s a very odd situation; a slim and easy to read novel that’s nevertheless taking me an eternity to read. Several times I’ve been on the brink of abandoning it through sheer frustration. Is this a below par novel because I’d sooner put it down and watch The Apprentice? Must I give up because the book is becoming so battered and tatty with age that it will probably disintegrate before I stop reading it? Is it a below par novel because I am begging for something more absorbing to throw itself in my path? The culprit is Johnny Come Home, the most recent novel from Jake Arnott. Arnott brought us the celebrated Long Firm trilogy, three books – The Long Firm, He Kills Coppers and truecrime – which delivered a perfect blend of popular culture and crime, real life characters mixed with the fictional. Harry Starks, the fusion of Ronnie and Reggie Kray into a believable, dangerous Judy Garland loving gangster and Joe Meek, the legendary pop producer of the early 60s, are just two memorable characters. So I was excited about Johnny Come Home, Arnott’s first non Long Firm novel. It’s familiar territory. Crime, the music business, fashion and homosexuality are typical Arnott themes. Set in the early 1970s, the book follows a set of characters on both sides of the law; a typical Arnott copper and typical Arnott suspects. Where the novel falls down is in the author’s choice not to include real people from history. Where The Long Firm imaginatively inserted the real Joe Meek into the action, Johnny Come Home presents a character called Johnny Chrome. An ageing rocker who grasps one last stab at stardom, reduced to singing over repetitive drumming tracks and prancing around in platforms. Yes, it’s a thinly disguised portrait of Gary Glitter. 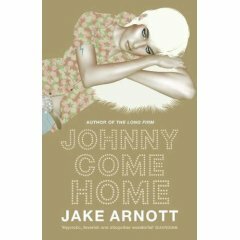 Johnny Come Home is a disappointment because Arnott fails to inject into it any of the originality he’s shown previously as a writer. And that’s why I’m at a crossroads with this novel; I feel he’s a one-trick writer – and one trick he’s cunningly spread across the whole of his earlier trilogy. Anyone who occasionally looks at these pages may be aware that I feel bad about abandoning books. I feel a duty – however odd – to finish a book once I’ve started it. Probably wrongly, I often feel it’s something lacking in me when I give up on a book. I feel am unable to appreciate something that’s often very widely acclaimed, I’m just too dim to get it when everyone else has. No Laughing Matter by Angus Wilson is a book that’s sat on my shelves for longer than I can remember. My yellow paperback copy has a inscription written by an old work friend (long since lost) who gave me the copy as a gift. Giving up on a book that I always meant to get round to makes the process all the more disheartening. The novel came back to my attention as it’s one that often turns up in top 100 lists. It’s one of Peter Boxall’s 1001 books before you die. It also turned up in last Saturday’s Guardian, named by several contemporary authors as the out of print book they’d love to see available again. Picking books from must read lists often has this effect on me. It’s the same with films – and I wouldn’t want to be watching Citizen Kane on a sunny day either. Browsing in a second hand bookshop, I overhead a customer making an unusual enquiry. She was looking for a set of encyclopedias – the old fashioned sort – because she’d seen such a set in a neighbour’s house and thought they looked very decorative. The assistant was sorry, but because they’d had a lot of people come in with similar enquiries they were out of sets of old fashioned books. She agreed that they could be highly decorative. Perhaps I am a book snob. I have an oldish set of encyclopedias – probably early 1930s – but it’s boxed away safely somewhere because it’s so hideously out of date. The lady in the second hand bookshop put me in mind of a friend of a friend – and this is probably an urban myth – who walked into a shop and ordered a yard of books. She’d just had a new shelf put up, and a yard of books would fill it handsomely. Although I have seen similar yards in other people’s homes, pristine sets of Booker winners and the like – never opened. Each to their own.